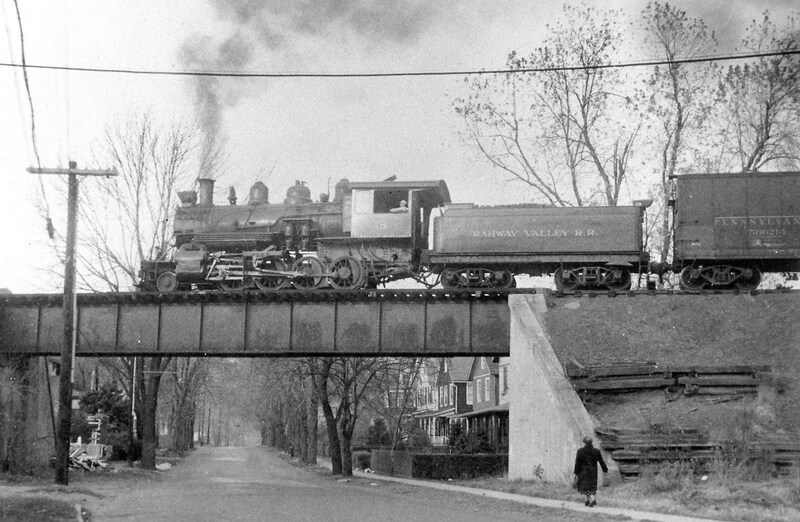 William Young's caption for this photo was "CROSSING BRIDGE at Summit, No. 15 nears top of 2.7-mile climb through Watchung hills with grades reaching 3 percent" Photo taken by William S. Young. Collection of George Wankmueller. Over Ashwood Ave. One span deck plate girder bridge for one track. Girders 66'0" long. Underclearance 15'0". Condition fair. No repairs. 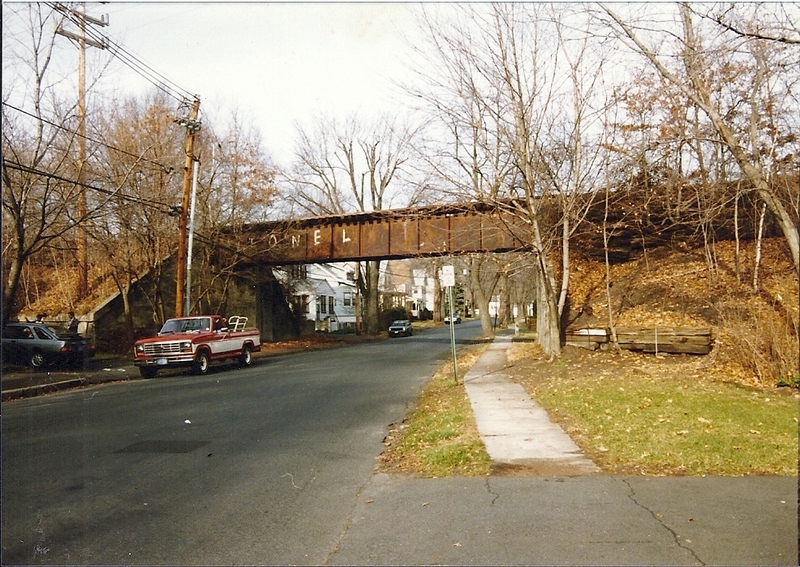 The Rahway Valley Railroad's bridge over Ashwood Avenue (MP 6.73) was one of four bridges the railroad had through the City of Summit. These four bridges effectively elevated the railroad and eliminated any possible grade crossings through the city. The bridge was originally constructed in 1905 as part of the railroad's extension to Summit. This bridge, along with the one over Russell Place (MP 6.67), were completed by October, 1905. Apparently the RVRR neglected to acquire the necessary permits to construct the two bridges over Ashwood Avenue and Russell Place. In the middle of the night the City of Summit, utilizing a steam roller, pulled the two bridges down from their abutments. Nicholas C. J. English, General Counsel for the railroad, negotiated with the City of Summit to acquire the proper permits. It is unclear whether entirely new bridges were constructed or the original ones, which were pulled down, were utilized. Nevertheless the bridge which served the RVRR for many, many years was stamped by the American Bridge Company in 1905. The RV's Ashwood Avenue bridge. Photo taken by Jeff Jargosch.